September 21, 2018 – On the cusp of our atmosphere live a thin group of seasonal electric blue clouds. Forming 50 miles above the poles in summer, these clouds are known as noctilucent clouds or polar mesospheric clouds — PMCs. A recent NASA long-duration balloon mission observed these clouds over the course of five days at their home in the mesosphere. The resulting photos, which scientists have just begun to analyze, will help us better understand turbulence in the atmosphere, as well as in oceans, lakes and other planetary atmospheres, and may even improve weather forecasting. On July 8, 2018, NASA’s PMC Turbo mission launched a giant balloon to study PMCs at a height of 50 miles above the surface. For five days, the balloon floated through the stratosphere from its launch at Esrange, Sweden, across the Arctic to Western Nunavut, Canada. During its flight, cameras aboard the balloon captured 6 million high-resolution images filling up 120 terabytes of data storage — most of which included a variety of PMC displays, revealing the processes leading to turbulence. Scientists are now beginning to go through the images and the first look has been promising. Noctilucent clouds coalesce as ice crystals on tiny meteor remnants in the upper atmosphere. 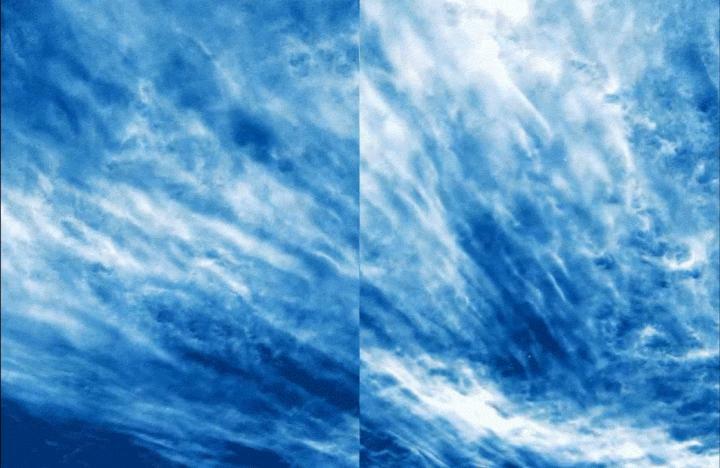 The results make brilliant blue rippling clouds that are visible just after the Sun sets in polar regions during the summer. These clouds are affected by what’s known as atmospheric gravity waves — caused by the convecting and uplifting of air masses, such as when air is pushed up by mountain ranges. The waves play major roles in transferring energy from the lower atmosphere to the mesosphere. The PMC Turbo balloon payload was equipped with seven specially designed imaging systems to observe the clouds. Each included a high-resolution camera, a computer control and communications system, and 32 terabytes of data storage. The seven imaging systems were arranged to create a mosaic of wide views extending one hundred miles across, with each narrow views able to image turbulence features as small as 20 yards wide. For the first time, a lidar — or laser radar — measured the precise altitudes of the PMCs as well as the temperature fluctuations of the gravity waves above and below the PMCs. Learning about the causes and effects of turbulence will help scientists understand not only the structure and variability of the upper atmosphere, but other areas as well. Turbulence occurs in fluids across the universe and the results will help scientists better model it in all systems. Ultimately, the results will even help improve weather forecast models. Understanding a wide range of processes in near-Earth space — including how they interact with Earth’s atmosphere and weather — is a key part of NASA’s heliophysics research, which employs a full squad of satellites and sub-orbital instruments to observe different phenomena from different perspectives. NASA also studies noctilucent clouds with the Aeronomy of Ice in the Mesosphere, or AIM, spacecraft, which launched in 2007 into a low-Earth orbit. AIM tracks large scale features in the clouds across a global scale, but can only resolve features a couple miles across. PMC Turbo helps fill in the details, explaining what happens at smaller scales where turbulence occurs. The PMC Turbo payload was successfully recovered from its landing site in the Canadian Arctic and the recovered instruments are expected to contribute to future missions, including one anticipated to fly next December over Antarctica.